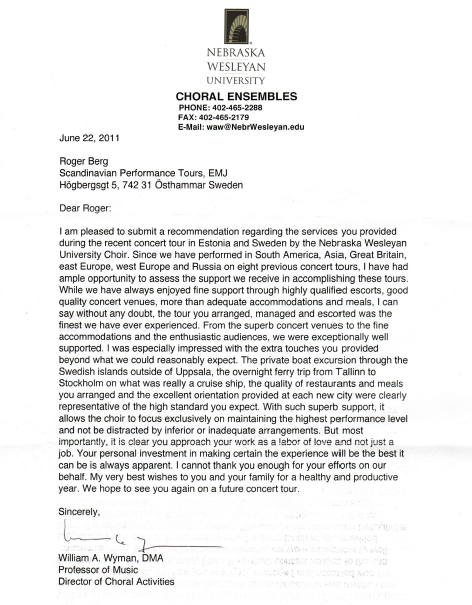 The opera tour that Roger planned for us was one of our best travel experiences. Our trains, hotels, and opera tickets were arranged perfectly. Tour Italia and how wonderful you were as organizers, hosts and guides. country sides and hilltop villages of the Sabina (Reiti) and Chianti. Wow…what can I say? What a wonderful experience! Everything was terrific, from dinners to the ice bar…. experience with the unique issues encountered by music groups. We thank you for the arrangements. The train journey, boat and bus journeys were good and on time. You meeting us in Stockholm station has been very helpful and thank you for the same. 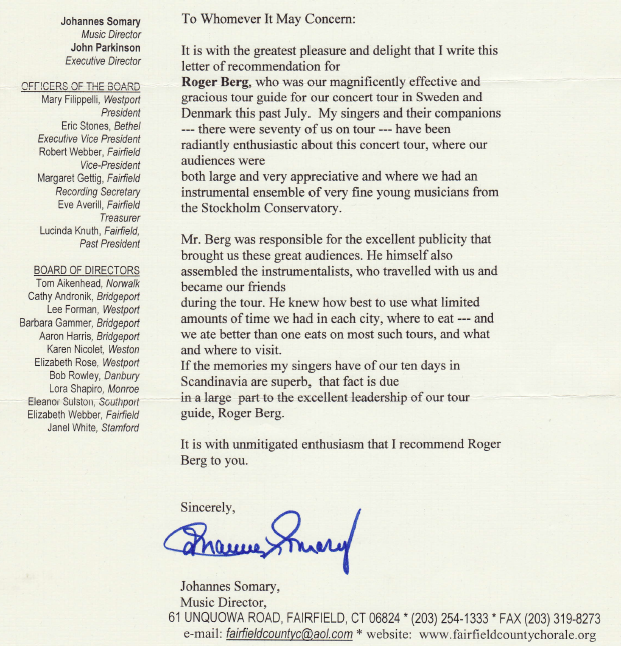 It is with the greatest pleasure and delight that I write this letter of recommendation for Roger Berg, who was our magnificently effective and gracious tour guide for our concert tour in Sweden and Denmark this past July. My singers and their companions — there were seventy of us on tour — have been radiantly enthusiastic about this concert tour, where our audiences were both large and very appreciative and where we had an instrumental ensemble of very fine young musicians from the Stockholm Conservatory. Mr. Berg was responsible for the excellent publicity that brought us these great audiences. He himself also assembled the instrumentalists, who travelled with us and became our friends during the tour. He knew how best to use what limited amounts of time we had in each city, where to eat -.- and we ate better than one eats on most such tours, and what and where to visit. If the memories my singers have of our ten days in Scandinavia are superb, that fact is due in a large part to the excellent leadership of our tour guide, Roger Berg. It is with unmitigated enthusiasm that I recommend Roger Berg to you.